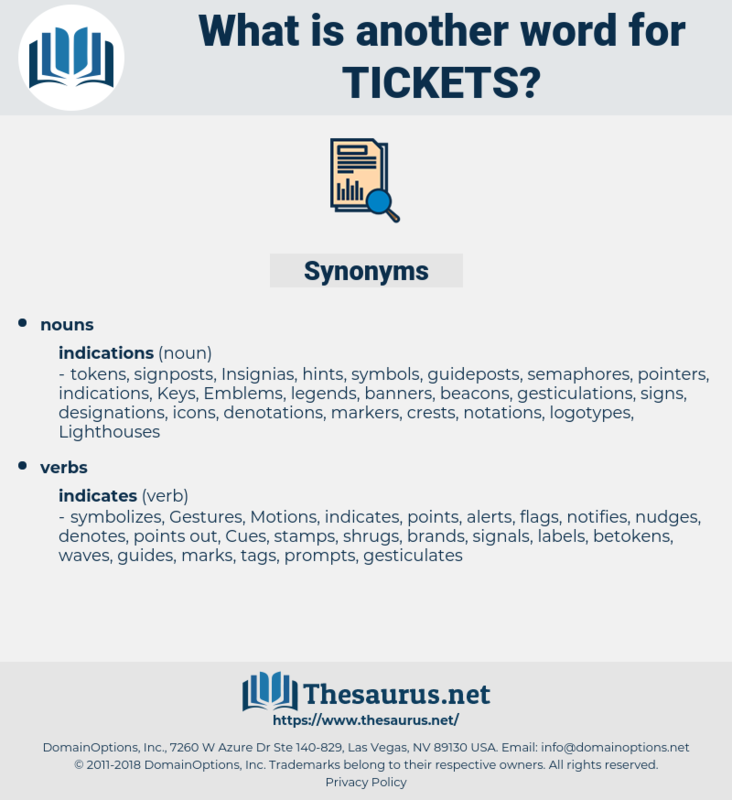 What is another word for tickets? interface, congress, inlets, posts, PN, puts, bank. receipts, credentials, certificates, seats, transactions, Incentives, denominations, qualifications, blankets, operations, solicitations, leaflets, marketplaces, passengers, checklists, invitations, worksheets, Carriers, electors, aircraft, Premiums, preferences, cards, markets, Securities, titles, gates, voters, airlines, items, titres, abstentions, machines, packages, instructs, earnings, Personalities, airplanes, misdemeanours, requirements, factsheets, sheetlets, postcards, desks, locations, revenues, letters, sites, spectators, incidents, passports, benefits, Incidences, implications, licences, premises, citations, openings, Fees, Prices, districts, intakes, audiences, respects, headings, performances, discounts, spots, sentences, crossings, viewers, rankings, billets, visitors, centers, acquisitions, centres, Schedules, chits, defects, tariffs, Opportunities, permit, Permits, minutes, entrants, backgrounders, positions, pieces, systems, formulations, expenses, moviegoers, headlines, occurrences, rates, placements, Records, advantages, photographs, Charges, sections, debts, purchases, tarifs, extracts, Photos, ballots, theatre, theatres, Cues, privileges, polls, arrivals, localities, VOTES, stamps, points, excerpts, dollars, offences, inmates, enquiries, profiles, personages, arrears, payments, fines, payable, rosters, prizes, slots, sales, statements, breaks, violations, parts, scorecards, listings, portions, Facilities, banners, Journeys, applications, fiches, claims, reminders, briefs, plane, planes, files, tails, Copies, Vacancies, deeds, guests, slips, wordings, charts, places, Activities, transfers, Queries, submissions, breaches, loads, bills, doorways, flights, summons, Summonses, exchanges, bucks, tags, LRBS, panes, influxes, villages, warrants, inflows, Yours, pros, offers, sweeps, fans, returns, Ones, unpaid, leads, Leaves, Journals, Mats, badges, demands, amends, Inquiries, burdens, requests, grand, zones, Maps, PORTS, PAGES, plots, spaces, favours, venues, Beds, bonds, Persons, IAS, squares, flags, transcripts, calls, awards, patrons, rolls, glens, Plays, hands, Levies, plugs, albums, towns, goodies, buy, flows, passes, Forms, Valleys, paragraphs, 50S, inlets, posts. entrances, contraventions, fare, banknote, banknotes. 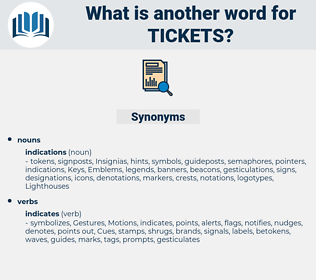 bookings, concessions, reservations, FARES, airfares, Lotteries, admissions, vouchers, sheets, concerts, coupons, papers, labels, Penalties, lists, passages, entrances, contraventions, banknotes. And did you buy the tickets?
" Tickets, please," said the porter.